Foaled March 17, 1850, Lexington was a bay horse by Boston – Alice Carneal by Sarpedon. He was inbred to Sir Archy 3×4 and his direct male line leads to Herod, through Diomed. Lexington went on to become the leading sire in North America a record sixteen times. However not without some controversy, his popularity with American breeders meant that his blood was widely scattered through the American Thoroughbreds. While this was fine with the American Jockey Club, the owners of the General Stud Book in England questioned his pedigree as to be not pure. Once his descendants began to be raced in England the proprietors of the General Stud Book, Weatherbys, held meetings with the Jockey Club in England to discuss the merits of the pedigrees of many of the foreign horses now racing and winning in the UK. 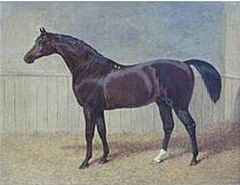 Lexington was not the only source of this outcry however because of his considerable influence in the breed, since his dam’s pedigree was suspect in their opinion. By 1913 when the ruckus became a roar, he was very predominant. This led to the controversial Jersey Act in that same year. The banning of legalized gambling at racetracks in America in 1912 would lead to much of the American bloodstock exported to Europe, in order for American breeders and owners to recoup their investments as the purse monies at home were dwindling due to the revenue loss from the prohibition of betting in the states. All of this political wrangling does not take away from the fact that Lexington was a great horse. He had begun his racing career under the name Darley. He won six of his seven races on the track. After winning his first two races, he was purchased by Richard Ten Broeck as part of a syndicate and his name was changed. He was retired early as a three year old due to declining eyesight. It was as a stallion where he became a legend. He sired four Belmont Stakes winners, two Kentucky Oaks winners, three Preakness winners and nine winners of the Travers Stakes. Furthermore, his son Preakness was the horse in which the second jewel in the American Triple Crown series was named after. Lexington’s eyesight grew worse as he aged to the point where he became totally blind, like his sire Boston had. During the American civil war, he was hidden away to avoid being constricted to army use. 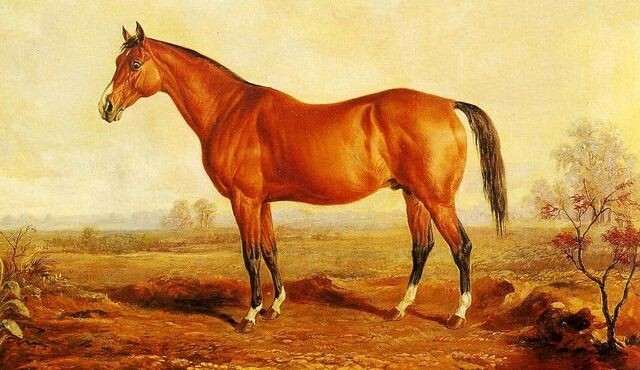 He died at Woodburn Stud in Kentucky July 1, 1875. His bones were donated by his owner several years later to the Smithsonian Institution in Washington. His likeness is adorned on the Woodlawn Vase which is presented to the owner of the Preakness Stakes winner, the race named in honour of his son. Bred in 1807, Whalebone was a brown horse by Waxy – Penelope by Trumpator. He was bred by The Duke of Grafton at his Euston Hall Stud, Newmarket. Penelope, his dam, was a top class racer who then became a very influential broodmare. She not only produced Whalebone, her second foal, but also Whisker. Both horses were sired by Waxy and became Derby winners, just as their sire had. In fact the Waxy – Penelope combination produced eight foals all told. Each one had names beginning with the letter W and each became winners. Penelope produced thirteen foals total in her lifetime. Whalebone was not the most handsome of individuals, especially when compared to his full brother Whisker, who was typical of Waxy’s offspring by being larger and with more scope. Whalebone was a mottled brown standing 15.2 hands full grown with a thick neck and body, short legs and ungainly feet. He was however an honest and pure horse on the track. He raced from age three to six. The Duke of Grafton sold Whalebone to Mr. Ladbroke in October 1812 for 700 guineas. Ladbroke kept him in training as a six year old and won three more sanctioned races and two additional match races. Ladbroke however was not altogether happy with the horse and considered him a poor stud prospect due to his size and appearance. He sold him to Lord Egremont in 1814. Lord Egremont stood Whalebone at his Petworth stud in Essex where he became a top stallion. At stud he sired Lap-dog and Spaniel, who both won the Derby, and three strong branches of the Eclipse sire line through Defence, Camel and Sir Hercules, the latter two sons becoming very dominant in future breeding pedigrees. He led the sire list twice in his lifetime. The Camel branch of the line founded the great sires Touchstone through to Newminster to Lord Clifden to Hampton. Hampton then sired Bay Ronald who in turn sired Bayardo and Dark Ronald. Sir Hercules was the grand sire, male line, of Oxford which led to Isinglass, John O’Gaunt and then to Swynford. While another grand son was Stockwell which led to Bend Or and ultimately Teddy and Phalaris.